Lagos State Governor, Mr. Akinwunmi Ambode; Deputy Governor, Dr. (Mrs) Aderanti Olubule; Special Adviser to the Governor on Education, Mr. Obafela Bank-Olemoh and Permanent Secretary, Office of Special Adviser on Education, Mr. Samsondeen Allison during the 25th Convocation ceremony of the Lagos State Polytechnic at the convocation ground, Ikorodu Campus, Ikorudu, Lagos, on Thursday, March 9, 2017. 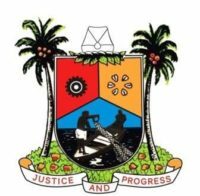 Lagos State Governor, Mr Akinwunmi Ambode on Thursday said the State Government would deploy drone made by the staff and students of Lagos State Polytechnic (LASPOTECH) to effectively carry out aerial security surveillance across the State. Speaking at the 25th Convocation Ceremony of the institution held at the main campus in Ikorodu, Governor Ambode commended the staff and students for being innovative, saying that government would do everything within its power to promote and fund the drone project to encourage them for the achievement. Governor Ambode also approved the construction of new Main Auditorium, Administrative Block, renovation of the Sports Complex and general facelift to the facilities within the campus environment including equipping and furnishing of the newly built School of Technology Building (Block A). According to the Governor, it was worthy of note that LASPOTECH, in its 40 years of existence, had occupied a pride of place among State-owned Polytechnics in Nigeria, but stressed that conscious efforts must be made to build on the successes achieved especially by becoming a true centre for excellence in technological education and research. He said being an emerging mega city, tertiary institutions and services in the State must be of acceptable global standards and be agents of development, adding that such was important for the State to compete favourably with other mega cities in the world. “Lagos State Polytechnic must rise to the challenge of meeting the technical manpower requirement of both the public and private sectors in not just Lagos State but in the whole nation. “We must rise above just providing education for the sake of acquiring a certificate to providing knowledge which will empower our youth to become champions of their generation, to chart their own course and establish enterprises that will create jobs and generate wealth for all. “Education is high on the priority list of this administration, and a significant portion of the State budget every year is allocated to education. We recognise the fact that a citadel of learning is as good as the quality of its learning environment in terms of infrastructure, academic and administrative faculties. Our government has invested massively in upgrading the infrastructure and other learning tools in all our tertiary institutions, including this institution. 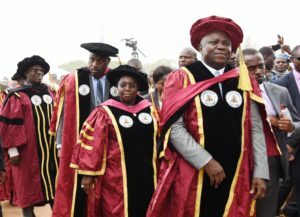 “The ultimate goal of this investment in tertiary institutions in Lagos State is beyond meeting the requirement for the accreditation of courses; it is to ensure that tertiary education in Lagos State becomes a bench mark in Nigeria, ranking comparatively with global institutions and producing the leaders of tomorrow,” Governor Ambode said. While reeling out some of the interventions by the State Government in the institution, Governor Ambode recalled that recent construction of the School of Technology Complex and approval for the recruitment of additional 89 academic staff as recommended by the Governing Board, as well as the extension of the Light Up Lagos Project initiative to LASPOTECH to ensure the safety and security to lives and properties within the campus environment. The Governor also announced increment in the number of participants for this year’s edition of Ready, Set, Work (RSW) programme of the State Government targeted at making final year students in tertiary institutions in the State to emerge as ready candidates for the increasingly competitive labour market, and more importantly, as job creators from 500 to 2000 students, while a total of 10,000 students would have the opportunity to participate in RSW Academy online. Besides, Governor Ambode charged the graduating students to be good ambassadors of the Polytechnic and the State, saying that remained the pivot upon which the hope of the nation revolves. Earlier, LASPOTECH Rector, Mr Samuel Sogunro commended Governor Ambode for his passion and commitment to development of education, saying apart from being the first Governor to participate in the convocation ceremony of the institution in the last 27 years, Governor Ambode despite the economic realities in the country, approved an increment in the monthly subvention to the institution from N153.731million to N210million. He said the Governor also approved allocation of N750million for the proposed accreditation exercise billed to take place in the institution, among many other interventions. A total of 9228 students graduated from 32 Departments, out of which 273 came out with distinctions. The overall best graduating student, Ejire Adedolapo Abdulazeez from the School of Pure and Applied Science was also offered instant employment with the State Government by Governor Ambode.